OK, so I guess that I need to significantly work on my follow through when it comes to pictures and system growth updates. I know that April is a busy month for everyone, but I have to say — this was VERY busy for us. We installed three systems in three weeks, participated in five different shows, and numerous other things. Anyway, enough prattling on about my issues. Just like last time, I am sure that y’all want to to see how things are progressing in the system, right? Well, once again, here you go. Where did you get the rocks at? 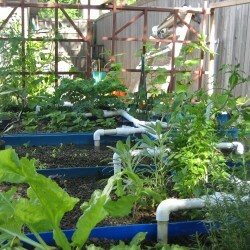 Becky — I recommend the use of Expanded Shale in aquaponic systems. I have found that the smaller size allows for more usable surface area to grow your bacterial colony and the roots of plants are better able to grow through the media as well. I source all of my media from local landscape supply companies in the DFW area. I have found that shale generally runs around $70-80 per cubic yard – which puts it clearly as one of the most affordable options. Please let me know if there are any other questions or concerns that I can answer/help you with. what size pump do you recommend for the IBC unit system? Sorry for the delayed response Neal. For an IBC system the way we design them, the fish tank is approximately 180 gallons. For proper operation of our Venturi aerator and flood/drain cycling of the growbed, you will want to pump a volume of water roughly equal to twice (or three times) the volume of your fish tank — so approximately 300 – 450 gph (at 3ft head height) would be perfect. We will be using an Active Aqua 800 in our demo system at our shop.